Seribu Islands Maritime Agriculture and Food Tenacity (KPKP) Sub-dept. holds open water diver and advanced training for certification in Pramuka Island. It is participated by 40 Seribu Islands people.
" Hopefully it can produce good and reliable divers in order to developing Seribu Islands tourism"
Seribu Islands Assistant in Economy and Development (Asekbang), Iwan Samosir hopes participants to collaborate with government and other private institutions in developing tourism in Seribu Islands. "Besides tourism, we also hope these participants to cooperate with us in fisheries development. Because Seribu Islands not only provides underwater tour, but also open water tour such as snorkeling and fishing," he explained, Monday (9/3). Seribu Islands KPKP Sub-dept. 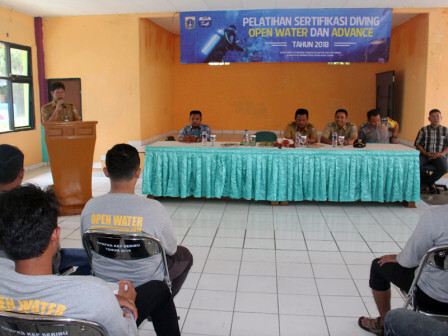 Head, Sutrisno said, diving training certification is one of resident's request in Musrenbang. He hopes this training can boost resident's economy. "Hopefully it can produce good and reliable divers in order to developing Seribu Islands tourism," he stated.